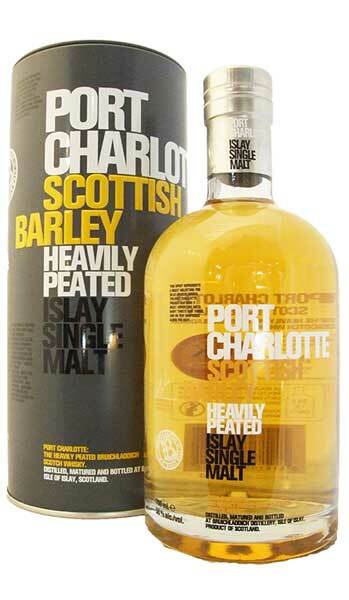 Pronounced “brook-laddie,” Bruichladdich sits close to Port Charlotte on Islay. Apart from a break in the 1920’s and 1930’s whisky has been produced steadily until 1983 when production ceased briefly. In 1985, the future looked bleak when the distillery’s owners, Invergordon, were taken over by Whyte and Mackay who chose to focus efforts on their flagship single malts, Dalmore and Isle of Jura at the expense of Bruichladdich. Thankfully the distillery’s future is brighter since its purchase by the whisky independent Murray McDavid in December 2000. Jim McEwan and his team have breathed life back into the place, with Islay’s first bottling hall also now installed. The whisky produced by Bruichladdich was traditionally one of the least peaty of the Islay malts, although ironically it is rated as the islanders’ favourite. In the future we will see different whiskies from these stills: the traditional unpeated, the 40ppm Port Charlotte, the monstrous 82ppm Octomore, a triple- and even quadruple-distilled spirit, an organic spirit…the list goes on. Nose: Opening with assertive waves of peat smoke and Atlantic squall, the olfactory system is on high alert in anticipation of some major sensory excitement. A swell of aromatics flood the senses with notes of iodine, salty canvas, crushed sea shells, charred oak staves, black pepper, paprika and leather tobacco pouches. The second wave brings vanilla, figs and soft plump dates, marinated pear, freshly milled malt, dark sweet toffee and cracked walnuts. It’s smoky. It’s smouldering. It’s sensuous. Just close your eyes and inhale long and deep. This is aromatic awesomeness. Palate: Wow! Waves of the sweetest, smoothest, warmest smokiest spirit that you have ever experienced flood onto the palate like the atlantic surf on Saligo Bay. It is potent, focused and the flavours explode brilliantly onto the palate. Full of depth and complexity, the smokey sweetness of the barley contrasts beautifully with the marine freshness of the spirit and the richness of toffee and vanilla. The complexity is enhanced further with a citrus twist and then mellow oak tempers the fire. Once the taste buds adjust to what is happening, they rejoice in the company and pleasure of this young Celt. Finish: It’s long and heart-warming, arousing feelings of pride and passion. It brings courage and strength, honesty and faith to your very soul. Medium length and somewhat cleansing and refreshing.